The Southern Illinois University School of Dental Medicine (SIU SDM) has been honored as a 2016 Center of Excellence by the national dental management firm LIBERTY Dental Plan. A special award presentation was held Monday, March 6 with LIBERTY representatives and State Representative Dan Beiser (D-Alton) in attendance. Illinois State Senator Bill Haine (D-Alton) also extended his support for the School’s recognition. LIBERTY’s Center of Excellence Award is presented to community dentists who have consistently demonstrated a commitment and dedication to quality care. “The SIU School of Dental Medicine has once again demonstrated its top tier status by being named a “Center of Excellence,” and it is a distinct privilege to have the School in my hometown and in my district,” Beiser said. Awardees were selected after a rigorous evaluation process which included reviews of office safety and compliance, appropriate delivery of dental services compared to regional utilization patterns, high member satisfaction which leads to loyalty and continuity of care, access and availability of appointments, and low member grievances and complaints. LIBERTY Dental Plan (LIBERTY) is a full service dental benefits company that has been providing dental services to Medicaid beneficiaries across the U.S. since 2005 and in Illinois since 2014, when the State authorized the Medicaid dental managed care program. LIBERTY administers dental benefits for its Illinois medical plan partners including Harmony and NextLevel Health Plans. Under the leadership of its founding dentist, Amir Neshat D.D.S., LIBERTY is committed to providing quality dental benefits with a focus on total body care that will lead to happier and healthier lives for Illinois Medicaid members. 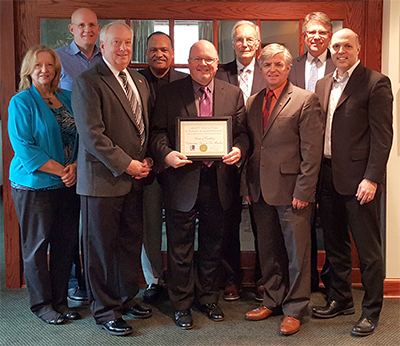 Photo: (L-R) Dr. Kathy Shafer, Dr. Eric Langenwalter, State Rep. Dan Beiser, Dr. Cornell Thomas, SIU SDM Dean Dr. Bruce Rotter, Dr. Bert Milligan, SIUE Chancellor Dr. Randy Pembrook, Mr. Ken Holbert and Dr. Kenneth Rawson.